The Saab 9-3 and Saab 9-5 were both awarded four stars in the latest EuroNCAP collision test. Both Saab models have also been awarded highest marks in the new side collision test. According to EuroNCAP, the Saab 9-5 is the safest car ever tested. But what is most important to Saab is still the real-life safety of its cars. "The excellent results we recorded in the latest EuroNCAP test are obviously heartening, particularly since this type of crash test often receives wide publicity," states Roger Malkusson, head of the Collision Safety Development Department at Saab. "But it is still important to bear in mind that individual crash tests cannot tell the whole story about the overall collision safety of a car. We develop our cars so that they will be as safe as possible in actual traffic accidents. So we assign the greatest value to collision safety studies made on the basis of realities, such as those continually being run by Folksam in Sweden and the HLDI insurance institute in the United States," says Roger Malkusson. Saab's own accident investigations also play an important role in the development of safer cars. Such investigations have demonstrated, for example, the need for a head restraint system that reduces the risk of whiplash injuries, which resulted in Saab being the world's first carmaker to launch the Saab Active Head Restraint in 1997. All Saab models are now equipped with this head restraint as standard. Accident investigations have also shown the importance of effective side collision protection. Biomechanical studies of occupant injuries sustained in side collisions have resulted in a special design of the door post in the Saab 9-3 and 9-5. The centre section of the post is very rigid so that it will not be deformed and intrude into the interior. On a collision from the side, the top part of the door post acts as a 'hinge' and retains its position, while the rest of the door post swings inwards like a pendulum. This reduces the risk of injury to the most sensitive parts of the human body - the ribs, head and chest. 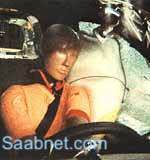 All Saab models are also equipped as standard with large side airbags that protect both the rib cage and the head of the occupant. The side airbags are made in two sections - a lower section and an upper section. When the airbag is activated, the lower section is inflated first to protect the occupant's rib cage, which is the part of the body that is the first to be subjected to impact in a side collision. When the rib cage is pressed into the lower section, the gas will be displaced upwards and will fill the upper section to protect the occupant's head which, at the instant of impact, is further away from the side structure of the car and is therefore subjected to the crash forces after a slight delay. In the Folksam safety study of cars on the Swedish market, the Saab 900/9-3 is the only car in its class to achieve the 'Gold group', which is what Folksam calls the group of five cars that are 50 percent safer than the average car. The Gold group also includes the Saab 9000, but the Saab 9-5 is too new to be included in the Folksam statistics. The report on the Folksam study can be accessed on the Internet on www.folksam.se/forskning/trafik/index.htm. This also applies to the American HLDI study in which the Saab 900 was best in its class for the fourth year running. Click here to view the report www.carsafety.org/ictl/ictl.pdf. The report is in pdf-file format which requier that you have Adobe Acrobat Reader installed on your computer. The software can be found at this page www.adobe.com/products/acrobat/readermain.html. * The EuroNCAP consortium comprises the Swedish Road Administration, the British and Dutch Ministries of Transport, the EU Commission, Féderation Internationale de l'Automobile (FIA), Allgemeiner Deutscher Automobil-Club e V (ADAC), Alliance Internationale de Tourisme (AIT) and International Consumer Research and Testing (ICRT).